IBM’s inaugural mega-conference took place in Las Vegas, NV, the week of March 18, 2018, and Clear Technologies was there en masse. Clear sent a group of sales reps, technical specialists, marketing professionals and company executives to see what is new in the industry, grow our partnership with IBM and other partners, and most importantly, host our many clients that were there for the conference. For the first time, IBM consolidated its many industry and platform specific conferences into one large conference. 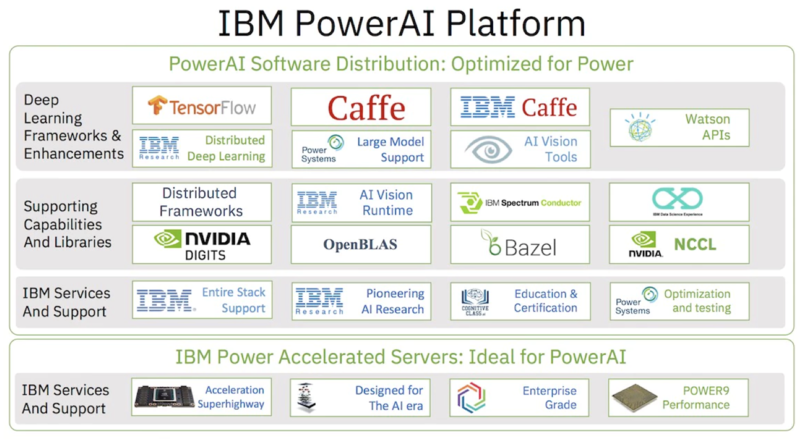 Deploying AI applications can get very complicated very quickly, which is why IBM’s PowerAI Platform is so interesting. At Clear, we are working on some incredible opportunities with clients to solve real business issues with substantial business impact. We would love the opportunity to discuss how AI and Machine Learning can impact your organization. IBM is leading the way with their cloud solutions that go beyond just offering a place to land your virtual machines at a low-cost. IBM is offering transformative solutions that help address the exponential growth of data and the tools to make sense of that data. IBM also leads the way with hybrid and new cloud offerings such as IBM Cloud Private. IBM Cloud Private offers the benefits of the public cloud such as scalability and ease of deployment but with increased control, security and much more predictable costs. We are working with IBM to architect agile technology strategies that are able to solve business problems quickly and efficiently using platforms such as Cloud. Storage continues to be an exciting piece of IBM’s portfolio as it looks to capitalize on its position as the #1 Storage Software Company in the World. New products such as Spectrum Protect Plus, which delivers modern data protection for digital business (go here for a free 30 day trial), are wildly different from IBM’s storage software products of old. You can’t watch the news these days without hearing about Blockchain in some form or facet. While some just associate it with cryptocurrencies or say it’s a solution looking for a problem, IBM is at the forefront of bringing the power and security of Blockchain to business. This year, the use cases for Blockchain seemed almost endless. IBM is using Blockchain to combat fraud, ensure food safety, create more intelligent supply chains, change the way we buy insurance, and much more. Blockchain is just starting the gain traction in the corporate world, but the momentum is rising fast. Interested in working with Clear on Blockchain? Join us as we develop, test and deploy Blockchain apps utilizing IBM’s Blockchain Platform. Business transformation was a popular topic at IBM THINK. One area of transformation was especially close to Clear Technologies. Clear’s President & COO, Phil Godwin, took the stage on Wednesday morning with IBM Senior Vice President of Global Markets, Martin Schroeter, to discuss transformation, including Clear’s multiple transformations over the last 25 years. Phil took the audience of thousands through the growth from just a reseller of IBM technologies during our founding in 1993, to becoming a true valued partner with the development of Visual Storage Intelligence, to where we are going now with our focus on solving business issues. You can read more about Phil’s thoughts on transformation and success in the future in his interview with CRN here.